If the idea of replacing snowmachine travel to take science outreach across Alaska with reindeer sounds absurd, you don’t know Kenji Yoshikawa. Kenji Yoshikawa feeds his reindeer treats while George Aguiar looks on. In the past, Yoshikawa built a sailboat and sailed from Japan to the Arctic Ocean, pushed a cart across the Sahara and skied to the South Pole. The University of Alaska Fairbanks research professor has taken the Permafrost/Active Layer Monitoring Program to 200 Alaska villages and 100 in Russia. After planning and dreaming for 15 years, Yoshikawa drove to Palmer a couple of weeks ago and bought two reindeer cows, transporting them to his Birch Hill home in a horse trailer. He has his fingers crossed and is anxiously watching to see if the deer are pregnant. Growing up in Tokyo, Yoshikawa was interested in travel and spent hours poring over a world atlas. He sailed into Barrow in 1994 and stayed two years, then came to Fairbanks to join the faculty of the engineering department at UAF. Traveling to remote areas of Alaska by snowmachine, Yoshikawa began researching reindeer as a method of transportation and became fascinated by Sheldon Jackson’s efforts to introduce reindeer to Alaska from Siberia in the late 1890s, early 1900s. 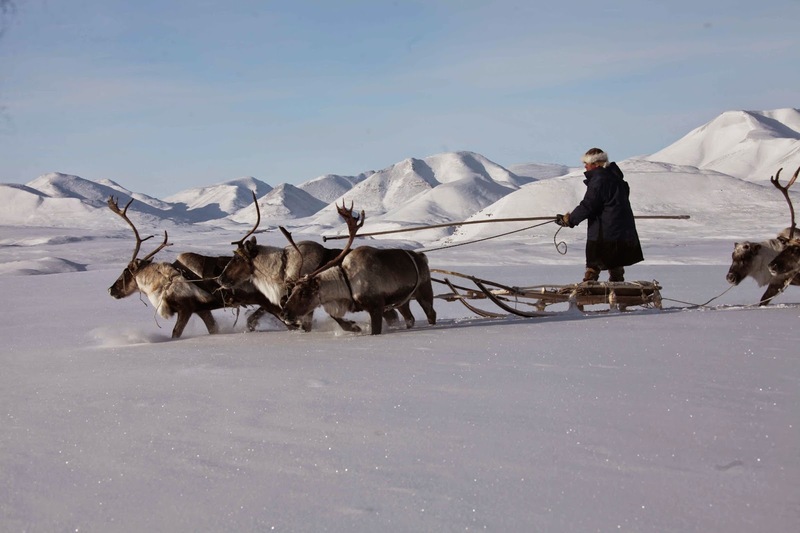 Not long ago, Yoshikawa spent a year in Russia as a Fulbright scholar, traveling to areas not even accessible by airplane, with reindeer pulling sleds. Yoshikawa was impressed that the reindeer didn’t need supplies for the long, arduous journeys; they ate snow and found food in nature. “I want to try to do this method,” he said. “It’s sustainable and environmentally friendly. You don’t even have to carry food for them. If they break through the ice they can swim.” The drawback is that reindeer are much slower than dog teams, he said. “Moving things from A to B; that’s what is interesting. And reindeer are an interesting way to go. While traveling in Russia, via reindeer and sleds, Kenji Yoshikawa took this photograph. While he learned a lot through the experiences in Russia, he noted that his colleagues there seemed to have no connection to the animals. He prefers to work with his reindeer in a different way, so much that he has set up a tent in the corral, intending to sleep there sometimes so the new calves will be accustomed to him. He envisions a future of traveling with the deer and at night in camp releasing them, knowing they will return to him in the morning. Yoshikawa figures it will take three or four years to build up the herd he wants. Before starting his project, he reached out to George Aguiar, UAF Reindeer Research Program research professional who also does outreach for the Cooperative Extension Service. Aguiar has been advising Yoshikawa on the best fencing methods and optimizing reindeer nutrition. For now, Yoshikawa is purchasing hay to feed the reindeer but he has bought 80 acres on Chena Hot Springs Road where he hopes to start growing his own hay. “I will have a new fence and system there,” he said. Kenji Yoshikawa examines his new fence.